jbs inspiration: May Arts Week with Doris Sander! Reminder: TODAY is the LAST day to enter the BIG GIVEAWAYS! You can enter the May Arts giveaway by clicking HERE and you can enter the JBS giveaway by clicking HERE. Also, don't forget to check out all the lovely May Arts + JBS creations on the May Arts Blog! Their crafty elves have been working overtimes! I love the look of neutral papers tied with pretty (real!) bows and handmade tags. 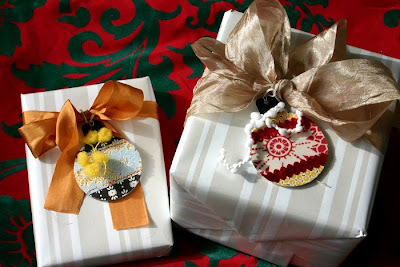 I created some little ornament tags with May Arts trims and JBS papers and then tied them on to my packages with May Arts ribbon. I used the large EK Success circle punch to make these. You will need to fold a piece of white cardstock in half and punch it along your fold so that you have an ever so slight flat edge on your circle. In other words, let the punch circle not cover the paper completely so when you punch through the two circles remain connected just a bit (like cutting connected paper dolls). 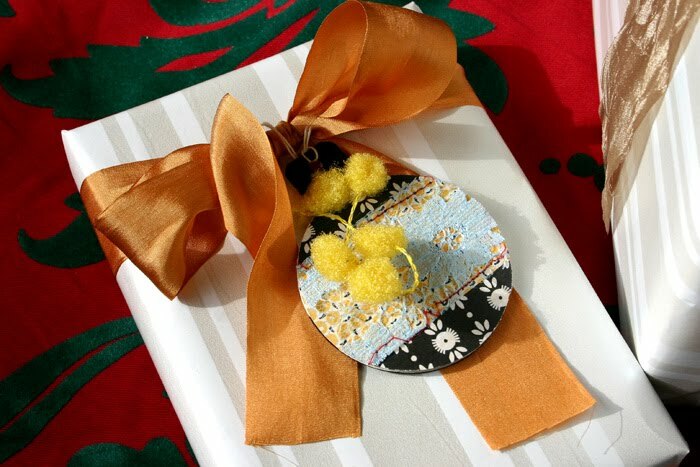 You will also need to punch an additional circle from patterned paper and another from plain cardstock. Decorate the front of your patterned paper circle with more patterned paper and trims. then adhere it to the front of your folder white circles. Cut a 3/4 x 1 1/4 inch rectangle from black cardstock. Use a corner rounder to round one end slightly. Punch a small hole in this end. 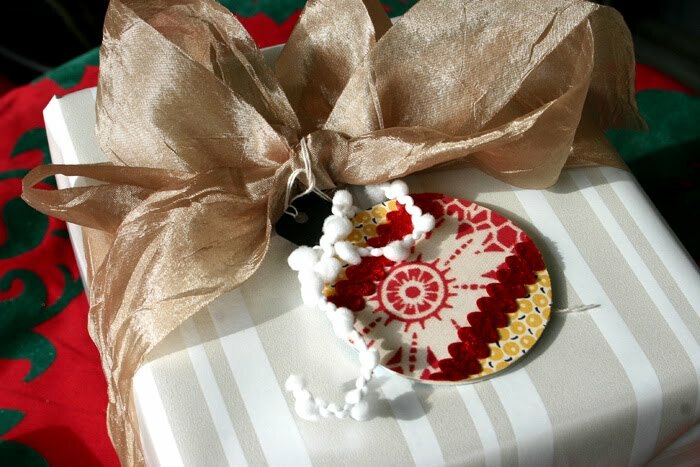 Adhere this rectangle to the back of your white folder circles so the the holed edge pops up from the top of the circles like an ornament hanger. 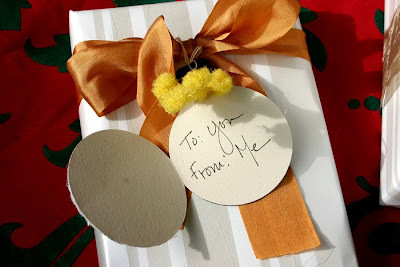 Cover the back of your folded white circles with the circle punched from cardstock. Add a string to the hole and a greeting to the side of the tag. Tie a little bow or wrap a piece of wired trim around the top. This will hold the tag closed. Merry Christmas! Wow, what beautiful presents!!! I wish my gift wrapping looked like this! such a cute idea, Doris! your packages look lovely!